"What's So Scary about Vermont?" In The Vermont Ghost Guide, Vermont's Ghostmaster Joseph A. Citro teams up with award-winning artist Stephen R. Bissette to answer that question definitively. Organized alphabetically by town, this remarkable pocket-sized collection of lore and line art points travelers toward dozens of mystifying sites to discover -- or perhaps avoid. 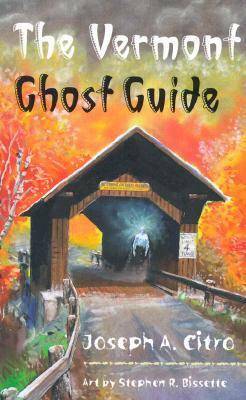 Both a guidebook and a reference tool, The Vermont Ghost Guide contains over 100 entries with 39 illustrations of haunted houses, ghostly spots, and mysterious events from every Vermont county. Many of the stories have never been published before. Vermont's mysterious mountains, hills, and hollows are rich with timeless tales of ghosts, phantoms, and horrible haunts, and Joe Citro has been covering that"dead-beat" for over a decade. In The Vermont Ghost Guide you'll encounter: - a poltergeist raining stones on a hapless North Pownal farm; - Northfield's Phantom Gravedigger; - a Ryegate ghostly door that appears and vanishes; - Charles Dickens's ghost guiding a writer's hand in Brattleboro; - a doppelganger's prediction of death in Cavendish; - the Midnight Cow, haunting the highways; - a miner's specter, embedded in stone; - the mysterious Eddy Brothers who marked Vermont as "The Spirit Capital of the Universe"; - and many, many more. But Be Warned! Citro's Vermont is not the idyllic New England wonderland of tourist bureaus and scenic postcards. These are shadowy haunts and whispered horrors, the ghosts, ghouls, gores, and mysteries of the Green Mountain State, rendered in eerie black-and-white by artist Steve Bissette. Perfect for visitors and residents, children and anyone else with an interest in or curiosity about Vermont history, legend, and lore, The Vermont Ghost Guide is sure to have a long shelf life and be of continuing interest for years to come.